Trouble broke out when members of the National Union of Women’s Suffrage Societies (NUWSS) held meetings in Tonbridge on 21st July 1913. One of the speakers ‘greatly aroused the indignation of a great number of the male portion of the crowd’. The lady concerned became ‘the subject of considerable hustling all along the High Street’, and police protection had to be called, according to the local paper, the Tonbridge Free Press*. 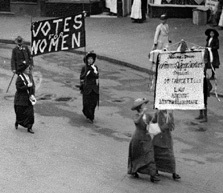 The NUWSS was the non-militant wing of the Suffrage Movement. It had organised the event in Tonbridge to draw attention to the ‘National Pilgrimage’ taking place at the time, in which some 50,000 women converged on London from all parts of the country, in order to demonstrate the strength of support for their cause. 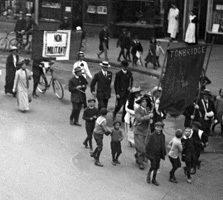 The more militant suffragettes led by the Pankhursts were active at this time also, though not in Tonbridge. In Tunbridge Wells they burned down the cricket pavilion at the Nevill Ground. One of the speakers at the Tonbridge rally was Miss Muriel Matters and it was probably her speech, delivered at the Angel Corner (the junction of High Street and Vale Road) which so incensed the men. Muriel Matters was a colourful Australian, a former actress who, before joining the NUWSS, came to public notice when she was imprisoned for chaining herself to the grille behind which lady visitors to the House of Commons had to sit at that time. She later flew over the House of Commons in a small airship bearing the words ‘Votes for Women’, throwing out handbills during the opening of parliament. In later life she stood unsuccessfully as labour candidate for her home town of Hastings. 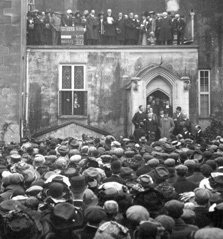 Following the speeches at the Angel Corner, a procession of NUWSS supporters marched through the High Street to the Public Hall, where a second meeting was held without incident. A resolution ‘that this meeting ... believes that the exclusion of women from Parliamentary franchise is unjust ...’ was carried unanimously. Another 15 years would pass before women finally gained the same voting rights as men. *The Tonbridge Free Press is available on microfilm in Tonbridge Reference Library.